The best way to describe Chicken Kofta Curry is Spiced Meatballs in Spiced (not “spicy”) Curry. 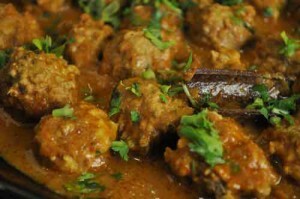 The ground/minced meat makes the koftas smooth and full of flavor. The curry, or sauce takes that flavor to another level making it delectably different from other meat dishes. This great make-ahead Chicken Kofta Curry recipe is perfect for a party or large crowd. Simple, easy, flavorful and a crowd pleaser…you can’t go wrong with this one! Mix all the ingredients for the Koftas and mix really well. Cover and marinate in the refrigerator for about 30 min. For Curry part, heat Oil in a pan on medium heat. Once hot, add the Cinnamon Stick and the Bay leaf. Pound the Cardamom Seeds and the Cloves in a Mortar and Pestle. Immediately after that add the Onions. Add a little Salt to speed up the cooking. Once the Onions get dehydrated and start to change color to a light golden. add in the minced Ginger & Garlic. Cook for just a couple of minutes. Add in the fresh Tomatoes and Turmeric powder and cook till the Oil separates from the mixture. Once the Oil has separated, add in the Coriander Powder, Cumin Powder & Garam Masala. Mix well and lower flame to a simmer. Add in the well-beaten yogurt slowly and stir continuously while adding. Add the Water to form the curry. Increase the flame to a medium, cover and allow the Curry to come to a rapid boil. Do the taste test and adjust the spices and the salt as needed. Increase the flame to a medium-high and maintain the rapid boil. Take out the Kofta mixture from the refrigerator and give it one more mix. Dip your hands in water and take a small amount of ground chicken (smaller than the golf ball) and drop it gently into the boiling Curry. Repeat process till all the koftas are in the curry. Do not touch the koftas. Lower the flame back to a medium, cover and cook for 20-25 minutes (longer if the koftas are bigger). After the 20 minutes, remove cover and mix very gently. Garnish with fresh Cilantro leaves and it’s ready to serve. Serve on a bed of rice or with Naans, Chapatis or some bread. 1. Use any ground meat of your choice – turkey, beef or lamb. 2. Make smaller Koftas for faster cooking. 3. Increase the amount of Garam Masala and Red Chili Powder to make it a spicier dish.